I visited an apple orchard last week and was captivated, wandering along the oh-so-straight lines of trees, the shapes and colours of the fruit – all sizes and hues. In amongst the apples were plums, crab apples, pears, cherries. Anything fruity. September is a time for plums, from bright reds, subtle yellows, and deep blues. What I noticed was the decay. 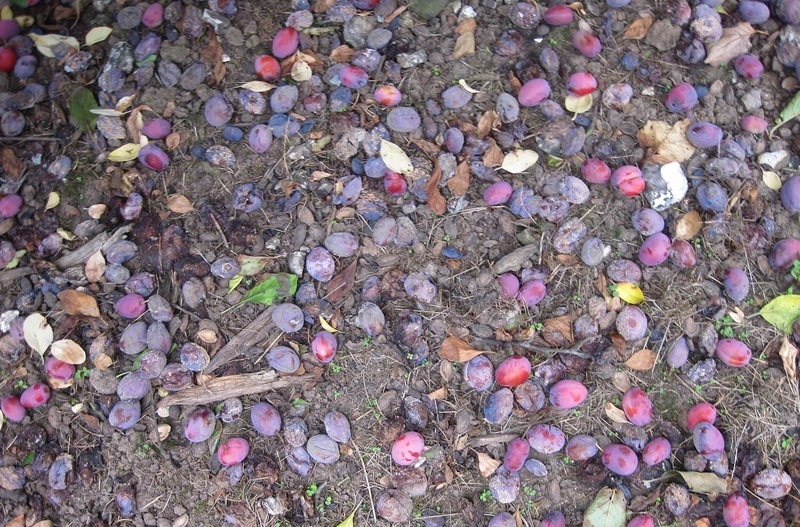 The fruit in various stages of decomposition, rotting right where they had fallen. And the scent, that sweet alcohol frementing scent of fruit in different stages of decay. But also the colours. Memo to self – don’t be such a lazy so and so, take your good camera with you next time! Originally posted September 16th 2011, and for some reason I managed to delete it, an dthen restored it, and then on I went round in a circle. And I still don’t know what has happened and how!